I was always going to be very excited to read Dance of Shadows by Yelena Black! Because while this is the start of a new paranormal series there is the added element of ballet dancing, and honestly, who doesn't love the sound of that? I really love the cover of this one. I think it's beautiful with the petal dress and the ballet pose and it just makes me happy just looking at it. 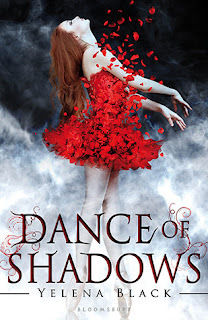 I decided to jump in with Dance of Shadows straight away and I wasn't disappointed. Despite some minor issues I had with this book, I still think this is going to be the first book in an excellent new series! Vanessa Adler is a somewhat reluctant ballet dancer who has been accepted into an elite ballet academy in New York. She's there mainly to look into the disappearance of her older sister, Margaret, who attended the same academy, got the lead role in the school's ballet and then was never seen again. I really loved this hint throughout the book that something happens to Vanessa when she dances, that the act of dancing calls out to something a bit supernatural. This combination of ballet dancing and some sort of mysterious dark magic that is going on in this ballet academy really worked perfectly. Together with the competitive nature of ballet dancers and the sort of mean girl attitude of some of the older female dancers in the school really set a great atmosphere as we start unravelling this mystery that Vanessa is determined to solve. And I love every snippet of ballet that Yelena Black gives us. Every one of them! As Vanessa learns more about her sister Margaret and also that other girls have gone missing during the school's history, she also collects a small group of friends around her. Vanessa definitely needs a strong support network as she navigates through this mess. Because it does turn into a bit of a mess. On the one hand, Vanessa catches the eye of the school hottie, Zeppelin Black, despite his relationship with the school's supposed best dancer. And she, of course, doesn't take kindly to the fact that Vanessa comes in as a freshman and manages to attract Zep away from her as well as nab the coveted lead role in the school's ballet, The Firebird. Also floating around is Justin, a rather mysterious fellow who knew Margaret and also seems to know more than he's letting on... what with Vanessa's new semi-relationship with Zep and her difficult training with ballet choreographer, Josef, Vanessa is finding it hard to work out who to trust and who to avoid. I really loved the build up towards the finale. There were some unexpected twists and surprises and I do always love that. I hope to see more ballet dancing and difficult and complicated relationships in the next book. I want answers to some of the questions Yelena Black has left us hanging with and I want to see more of this interesting ballet-inspired paranormal activity! I just want more in general! Ive recently read this too and felt pretty much the same as you. I also felt the ending was suddenly very quick compared to the rest of the book which threw me off a little but I still enjoyed and think it'll be a good start to a series. Yeah, now that you mention it, the pace at the end was lightning quick! I really think it's a great start to what will be an interesting series! Thanks Lucy :) My main problem with Vanessa was her romantic choices! Choose someone with more than just a pretty face!